Spray 13x9-inch pan with cooking spray; line with cooking parchment paper, leaving overhang on 2 sides. In 2-quart saucepan, heat honey, brown sugar and coconut oil over medium heat, stirring as it melts. Heat to boiling; remove from heat, and stir in almond butter. Pour mixture into large bowl; stir in cereal to coat well. While still warm, press mixture firmly in pan. Microwave chocolate chips in microwavable bowl uncovered on High in 30-second bursts, stirring after each burst, until melted and smooth. Spread evenly over bars. Refrigerate about 30 minutes or until firm. Cut into 6 rows by 3 rows. Use bottom of flat glass to press cereal mixture firmly into pan. 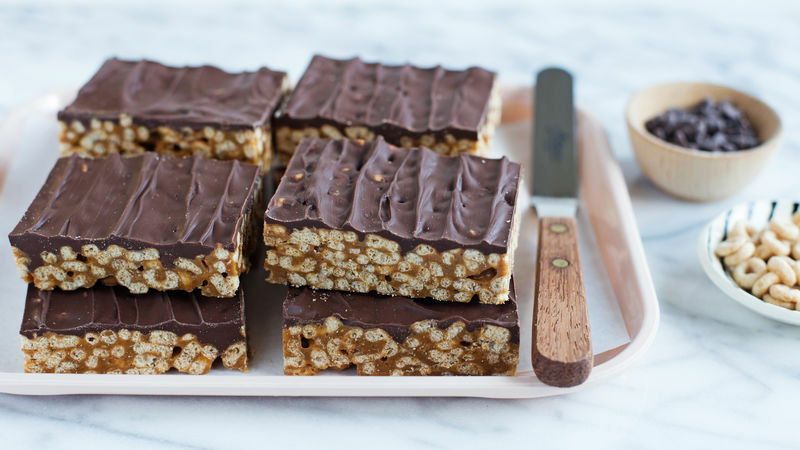 These bars will become hard after time if you store them in the pan. To keep them chewy for a few days, just wrap individual bars tightly in plastic wrap, and store at room temperature.